I am George’s sister whom he never met. I was born two years after his death. Now, being the only member of my immediate family still alive, I want to tell the stories I heard about George and dedicate them and him to the ages. Please read the section about my mama and her project through the years to turn this family loss and tragedy into a blessing to other service men and their families. She loved to receive letters of testimony about people being encouraged by George’s little book up until she died at 94 years of age. After the award ceremony for mama at the Pentagon, our family was invited to Fort Bragg where Mama was the honored guest at a parade and a street was named in honor of my brother, Tullidge Way. At that time, my brother Tom donated the original letter George had written to him (in the front of the booklet). Tom said, “George would have wanted the letter there. ” Mama was also awarded the Iron Mike Award of service from the enlisted soldiers at Fort Bragg. Just recently, a great niece was visiting the American Cemetery to visit George’s grave. At the entrance you enter a building and a docent locates where your loved one is buried. He will walk you to the stone. He asked my niece if she was related and she said ,” Yes.” The guide said that there are quite a few visitors who ask to visit George’s grave purely from his story and A Paratrooper’s Faith with no blood family connection at all. That alone encouraged me! What a beautiful legacy of my Mama’s love for her son and her generous and giving spirit and faith. .
Krause and Lt. Colonel Benjamin H. Vandervoort both received the Distinguished Service Cross for their actions in the capture of the town. Sgt. 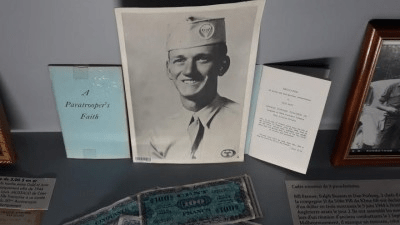 George Bowler Tullidge III received the Bronze Star, while a collection of Bible verses and of his letters home, A Paratrooper’s Faith was distributed throughout the 82nd Airborne by his parents from after his death until the 1990s. 2nd Lt. Thomas J. Tighe of the 70th Tank Battalion received the Silver Star posthumously for his actions on the morning of June 7th in securing the town, during which he was killed when his tank was hit by German artillery fire. 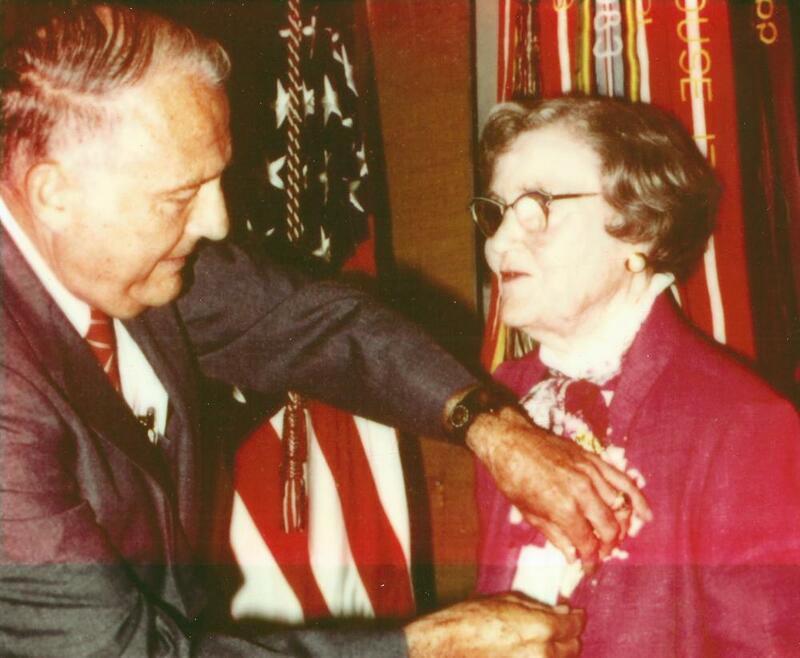 In 1989, Anne Archer Tullidge was awarded the “Decoration for Distinguished Civilian Service” by John Marsh, Secretary of the Army, who cited her personal commitment, deep concern, and unselfish devotion to the United states Military. She printed and distributed 300,000 booklets over 50 years. We, her family, are honored to continue this, her project. Anne Archer Hogshead Tullidge, author of ” A Paratrooper’s Faith” died in 1995. She used the pain and loss of her oldest son’s death to be a source of comfort and encouragement for thousands of others. George’s final resting place with his fellow American soldiers in the American Cemetery in Cambridge, England. 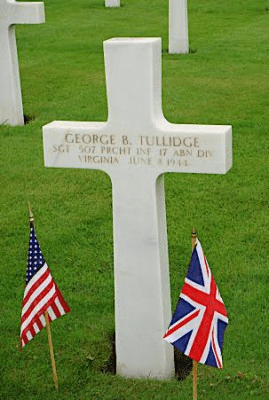 This entry was posted in Uncategorized and tagged 82 Airborne, A Paratrooper's Faith, D-Day, France, George Bowler Tullidge III, heroes. St Mere Eglise, Invasion of France, www.aparatroopersfaith.org. Bookmark the permalink. Enjoy the Fourth – for George’s sake!! Have a Happy 4th of July. We must remember the endless sacrifices of people like your brother George, who gave and who kept this country free, and A Paratrooper’s Faith is an excellent way to help remember. Thank you, Anne. I read at least one posting a day. My pleasure and thanks for remembering and encouraging ! Anne I did not know this about your brother! Those paratroopers were amazing and sacrificial. I so glad that you have passed on this story, thank you!! Thanks Maureen. .. .Check out the website that my son Chris made. I recently heard from The National WWII Museum. Being as I do not have any blood relatives left in my family, they want my collection of WWII items. This would include the picture of your brother, mother and the copy of The Paratrooper’s Faith that you sent me and I have framed. I have made arrangements for after my death for everything to be shipped to New Orleans. (Thankfully they are building onto the museum.) Since I am not ill at the moment, you have (I hope) plenty of time to say No, if you wish them not to be sent there. Feel free to delete this message if you so wish. Oh my friend, what an honor you give me and my family. That is an outstanding and perfect place for your WWII treasures. I am touched you consider my family’s history worth preserving! God bless you! You made my day, Anne. Take care.